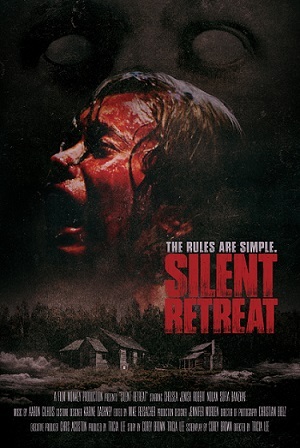 It’s nice to use the phrase “silent but violent” in the context of something that doesn’t stink and Silent Retreat has a lot going for it, despite being a member of subgenre we’re not overly fond of: hissing creatures who skulk about on all fours. 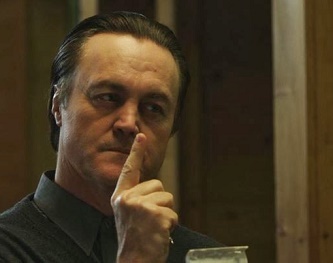 The Toronto Star called the plot “whisper thin” — which as we’ve pointed on occasion here is pretty irrelevant when it comes to horror as long as the frights are delivered. Hell, the plots to thousands of movies can be summed up in title alone: Sorority House Massacre? Spoiler alert: It’s about a sorority where a massacre takes place! Anyway, Silent Retreat has a few genuine scares and looks beautiful to boot, even if the budget was the equivalent of four-year college tuition. A girl Janey, played by an actress with a promising future and a great nose (Chelsea Jenish) is sent to a small boot camp in the woods that specializes in giving its all-female, er, inmates would be the way to put it, the silent treatment. They’re deprived of all technology and given the sparest of accommodations (though weirdly, given Perrier with lunch). Speaking without being spoken to is punishable by taking away dinner and the program is supplemented by meditation / brainwashing and run by a creepy doctor who resembles Jimmy Page, along with his two factotum sons. Reviewers have read the whole “voices being silenced” as obvious feminist subtext; this is somewhat ironic given the debate-quashing PC impulses held by some members of the far political left but…it’s interesting anyway, if a bit forced. As a bonus we’re not led down the garden path of “psychos who run weird correctional facility, act all psycho.” Instead, it’s what lurks in the woods that’s the real danger. There’s a nice bit of viscera slipping, some surprise killings and the performances are pretty good…the denouement is a bit unsatisfying but it’s nice to see (or is that hear?) a movie that is this silent through the first quarter.